This image of the traditional World Fantasy Award’s Lovecraft bust created by Gahan Wilson is displayed on the 2015 WFC web page. The 2015 World Fantasy Award shortlist has been released. The ballot was picked by a two-step process. The two items in each category receiving the most nominations from members of the World Fantasy Convention were placed on the final ballot. The remainder were added by the judges. The 2015 World Fantasy Awards judges are Gemma Files, Nina Kiriki Hoffman, Bénédicte Lombardo, Bruce McAllister and Robert Shearman. The winners will be announced at the World Fantasy Con in Saratoga Springs, NY from November 5-8. Already announced are the World Fantasy Life Achievement Winners: Ramsey Campbell and Sheri S. Tepper. WFC To Continue With Lovecraft Bust? Last year Daniel Jose Older collected over 2,500 signatures on a petition calling for the replacement of “avowed racist and a terrible wordsmith” H.P. Lovecraft on the World Fantasy Award. The Guardian reported last September that the “board of the World Fantasy awards has said that it is ‘in discussion’ about its winners’ statuette”. 2. The Elephant in the Room I think I used those words. I think I said “I can’t sit down without addressing the elephant in the room, which is the controversy surrounding the image that represents this award.” I said it was awkward to accept the award as a writer of color. (See this post by Nnedi Okorafor, the 2011 winner, if you are confused about why.) I also thanked the board for taking the issue seriously, because at the beginning of the ceremony, Gordon van Gelder stood up and made an announcement to that effect: “The board is taking the issue very seriously, but there is no decision yet.” I just wanted them to know that here I was in a terribly awkward position, unable to be 100% thrilled, as I should be, by winning this award, and that many other people would feel the same, and so they were right to think about changing it. In May, File 770 reached out to the WFC Board about the status of the Lovecraft image but received no acknowledgement. This entry was posted in Awards and tagged World Fantasy Award, World Fantasy Convention by Mike Glyer. Bookmark the permalink. That statue must have looked cool and cutting edge and modern back in the 1950s or whenever it was made. Fashions in art have moved on. Maybe fashions in award design can too. Probably no earlier than 1975. I don’t care when it was created; its appallingly ugly. Simply having something like that in the room with me would depress me. I don’t care when it was created; its appallingly ugly. I think you have to like Gahan Wilson to have any appreciation at all for it. I have to admit that the fact that it comes with a warning not to put it in a fish tank because it kills the fish amuses me immensely. Perhaps the new award could be made of the same stuff? 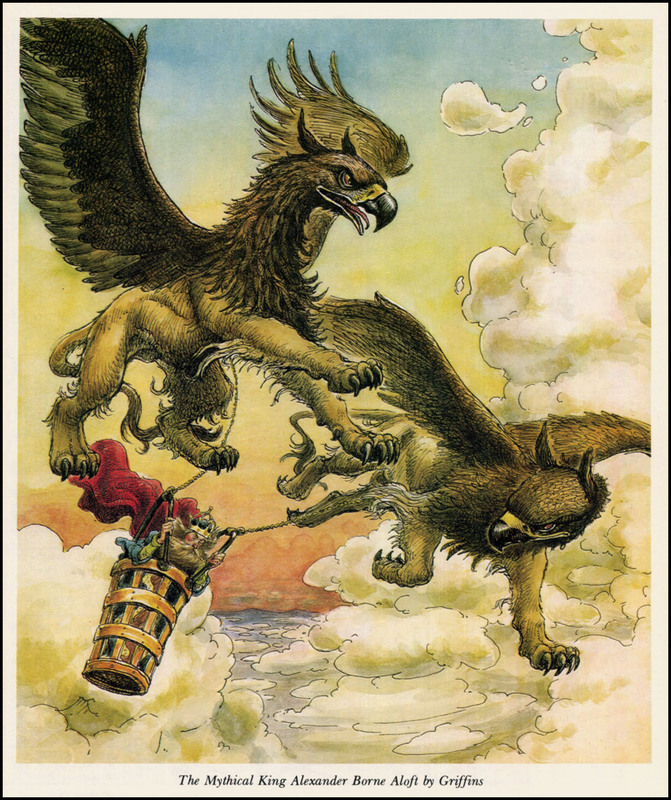 I like the chimaera idea, because it is a creature of fantasy, it’s a nod to the mingled influences that inform fantasy, and yet it can also be read as a nod to the multiple related genres that it has honored in the past–SF and Horror being two such. A dragon is indeed iconic fantasy, but doesn’t quite have the same “many influences” feel. It is certainly striking, but the more I look at it the more I really don’t want to be in the same space with it; I’m perfectly happy for people to want anything apart from Tolkien but the thing is almost malignant. Stephen King ain’t gonna make for a better-looking statuette. That only makes it better! I think we’d better stick to dollars; the euro and/or drachmas are tricky this year! I’ve been looking at Sheila Gilbert’s Hugo packet; 45 years in the business, 16 books plus one she co-edited with Betsy Wollheim in the 2014 period, and a chapter from all 17 so we can make our minds up on what we see. Also, there are dragons! I’d like to thank Meredith for inspiring one of my worst ideas ever. Considering its ubiquity in fantasy novels, perhaps the award should be a representation of a bowl of stew? In all seriousness though, I think the award should represent magic itself in some way. Ive always thought it could be represented by a hand wreathed in fire or holding a magic orb ( a geode, perhaps). Something reminiscent of a palantir or something. Or Baba Yaga’s hut. A clockwork one would be even better. Or give it one chicken leg and one clockwork leg! Alain: The Bone Clocks is an excellent novel whatever the category it falls under. That is another one I would have liked to see nominated for a Hugo. I enjoyed The Bone Clocks. But I just can’t say I loved it. I don’t know if it’s because Mitchell works so hard at not being an author of SFF, or what — but for me, it just never crossed over the boundary from good to great. I’ve always thought it would be more appropriate for a Horror Award than a Fantasy Award (but the Bram Stoker Award statue is pretty cool). It would be really nice if, when they run out of the stock of statuettes, they’d go with something like Carrie Cuinn’s suggestion of a sea serpent wrapped around the world. @JJ I really like the diversity of the book and thought it was extremely well structured. I may be influenced by the fact that I had a friend read it at the same time that I did and we discussed it throughout our readings which was really enjoyable. She doesn’t usually read genre books so it was a nice surprise as well. I love, lovecraft’s work. I would be willing to have a stab at defending the man on the grounds that so far as I know he never hurt anyone directly, and by virtue of dying in basic poverty himself did not even economically benefit by a racism that he was beginning to outgrow in his latter years. That said, by all means change the award, only an idiot offends people without reasonable cause. Let’s have an image which does not require a defense. If it is to be used as a justification for brushing aside people and disregarding their complaints, then it should be done with the conscious awareness that it is a deliberate choice. It’s true, someone will always complain. But not all complaints are equally meritorious. I like the chimera idea, and also the idea of a world serpent. Heck, make it Yggdrasil and it could be a junior Christmas tree, too!